My first impression of the Japanese umbrella pine was that I was looking at a species of yew (Taxus spp.). Sure, its features were a bit more exaggerated than I was used to but what do I know? Trying to understand tree diversity is a recent development in my botanical obsession so I don’t have much to base my opinions on. Regardless, I am glad I gave the little sapling I was looking at a closer inspection. Turns out, the Japanese umbrella pine is most definitely not a yew. It is actually unique in its taxonomic position as the only member of the family Sciadopityaceae. 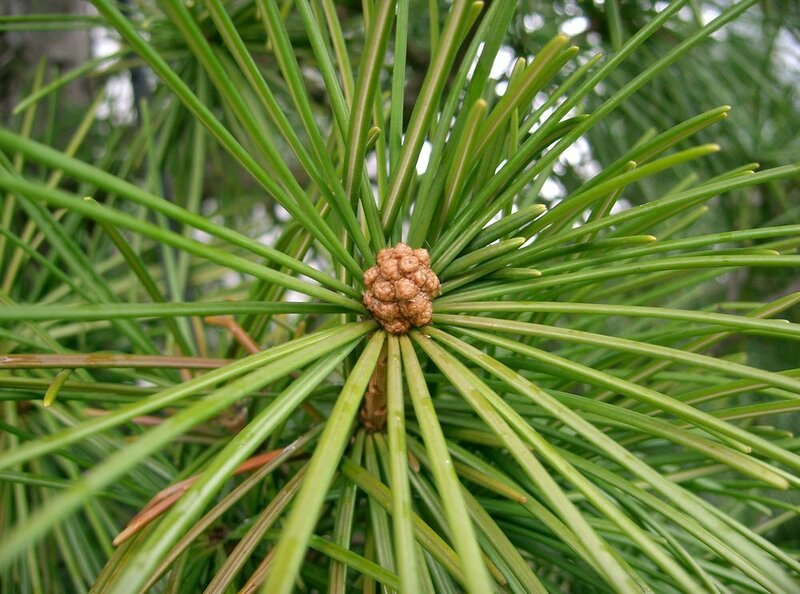 It seems that the true leaves of the Japanese umbrella pine have, through evolutionary time, been reduced to tiny, brown scales that clasp the stems. I am not sure what evolutionary advantage(s) cladodes infer over leaves, however, at least one source suggested that cladodes may have fewer stomata and therefore can help to reduce water loss. Until someone looks deeper into this mystery, we cannot say for sure. As a tree, the Japanese umbrella pine is slow growing. Records show that young trees can take upwards of a decade to reach average human height. However, given time, the Japanese umbrella pine can grow into an impressive specimen. In the forests of Japan, it is possible to come across trees that are 65 to 100 ft (20 – 35 m) tall. It was once wide spread throughout much of southern Japan, however, an ever-increasing human population has seen that range reduced. A 49.5 million years old fossil of a Sciadopitys cladode. The gradual reduction of this species is not solely the fault of humans. Fossil evidence shows that the genus Sciadopitys was once wide spread throughout parts of Europe and Asia as well. Whereas the current diversity of this genus is limited to a single species, fossils of at least three extinct species have been found in rocks dating back to the Triassic Period, some 230 million years ago. It would appear that this obscure conifer family, like so many other gymnosperm lineages, has been on the decline for quite some time. Despite the obscure strangeness of the Japanese umbrella tree, it has gained considerable popularity as a unique landscape tree. Because it hails from a relatively cool regions of Japan, the Japanese umbrella tree adapts quite well to temperate climates around the globe. Enough people have grown this tree that some cultivars even exist. Whether you see it as a specimen in an arboretum or growing in the wild, know that you are looking at something quite special. The Japanese umbrella tree is a throwback to the days when gymnosperms were the dominant plants on the landscape and we are extremely lucky that it made it through to our time.